Hello Wrightians, Does anybody have stories, info, and specially plans?? Does exist a floor plan of this house? I have seen only 3 renderings, nothing else. 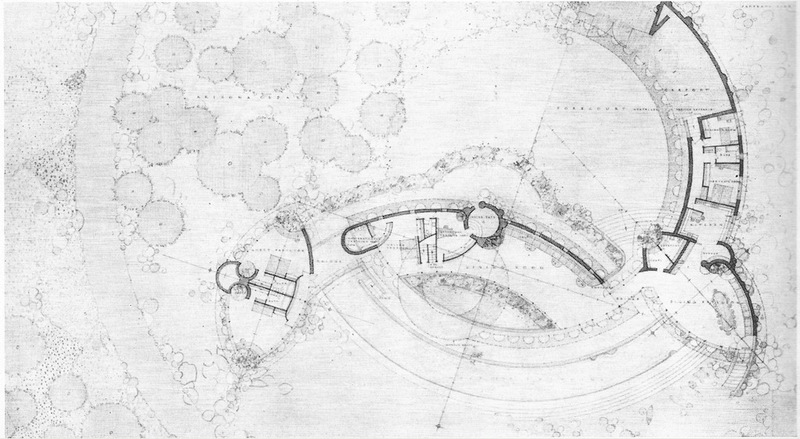 I think this is one of the most beautiful and interesting unbuilt projects. Greetings.!!! There's this previous thread. 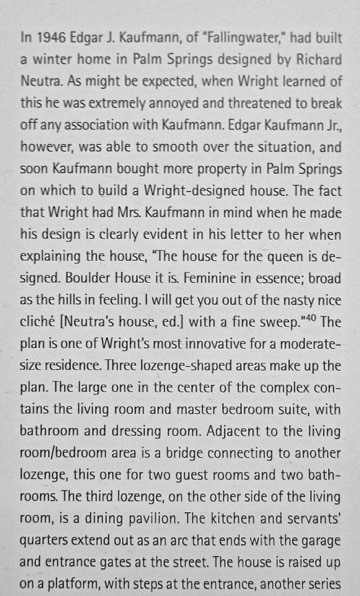 I don't know where the Boulder House plan was published; it isn't in Monograph 8 nor in Taschen. 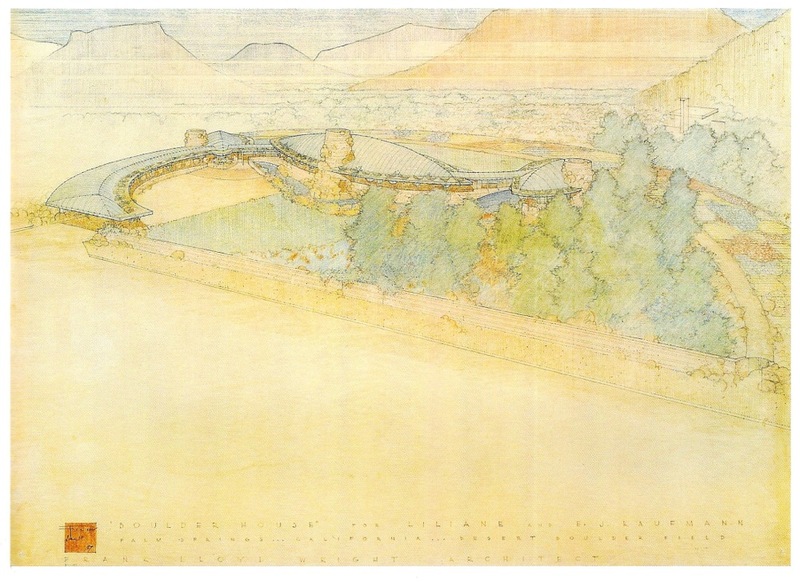 Franklin Toker's Fallingwater Rising has information on the design. He believes, like Taschen and unlike GA, that it was for Liliane alone, after she and her husband were no longer living together. I've also seen the claim that it was for Edgar Jr. 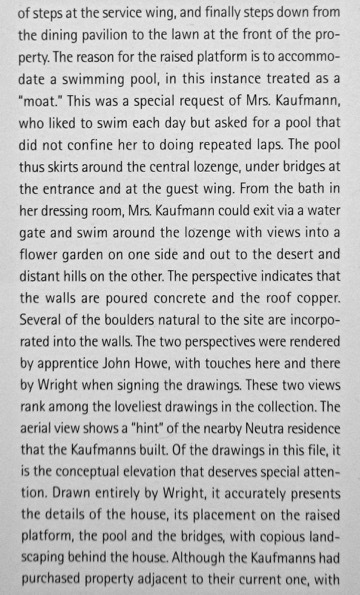 In some thread or other here, one of the participants pointed out that the building in the background at upper right of the drawing is their Neutra house. 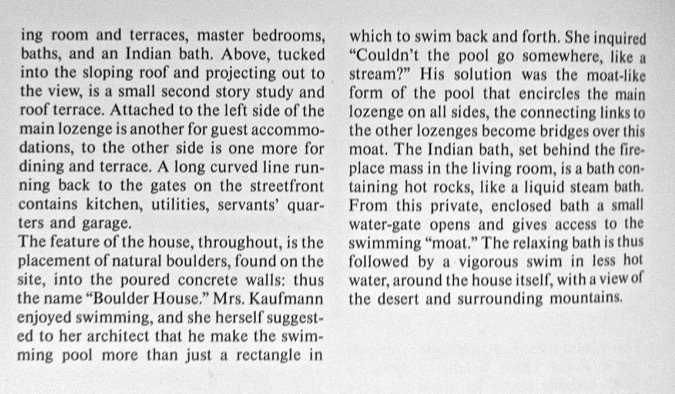 I hadn't heard that they parted; I had thought that when she died (at Fallingwater ?) they were together . . .
what does that radiused grid have to do with the elevation above? I wondered the same. Compare that elevation to the plan above; they seem to be oriented the same, so the view in the elevation is centered on the strong centerline on the plan: bedroom pod left, LR center, dining room right. If so, we might conclude that the radial array is intended as the armature for the plan oriented (roughly) as it is on the plan drawing, to be used by the drafter to transfer true points from the plan, onto his elevation . . . This is a rare plan version of the perspective-construction device seen at the bottom of some rendered views -- the plan drawn in planar perspective ? Deserving of a thread of its own, the built hemicycles and lenticular plans are clustered between 1945 and 1953, with a few outliers. Laurent - 1949 -- first built lenticular ? 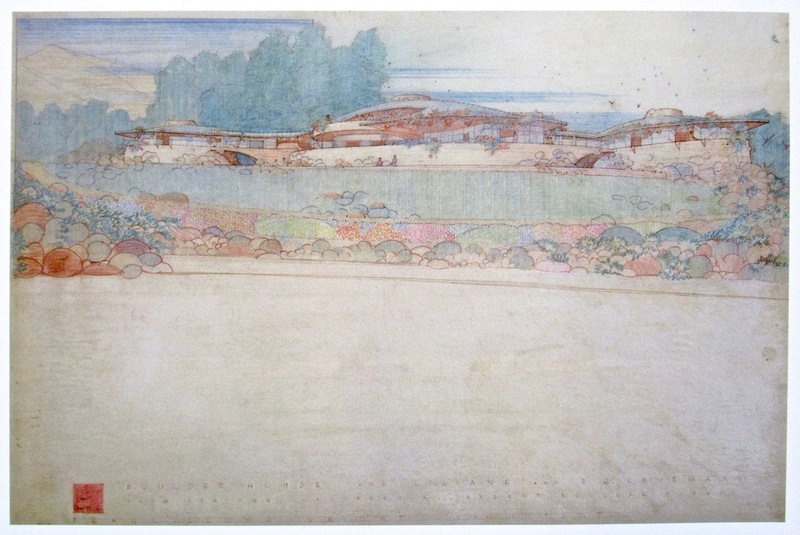 The next step would be to locate the unbuilt designs -- and collect illustrations of them all . . .
You may be correct but I thought the view was OFF center of that line. and if so then remarkable. But how it works exactly I don't understand yet. the two radius points of the major intersecting circles of this project about 18 clicks apart. The other is the forecourt radius point located in arc of the bushes around the pool. The radius points for the flanking pods can be seen too. would correspond to a specific point on the plan. But the portion of the 120º grid that's actually used on the plan is barely 90º, so the drafter was giving himself some extra room, for some reason -- never a bad idea, in life ? 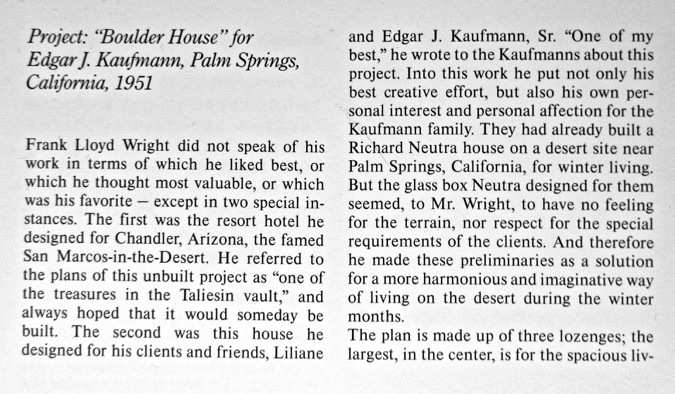 Geiger insisted that the Boulder House was commissioned by Edgar, Jr. for himself, though he may have misrepresented that fact to FLW to ameliorate the situation.